After looking at the Wicked Women in today’s film world, Warpaint has averted its gaze from the ladies and cast our eyes onto the Mad Men of the screen. 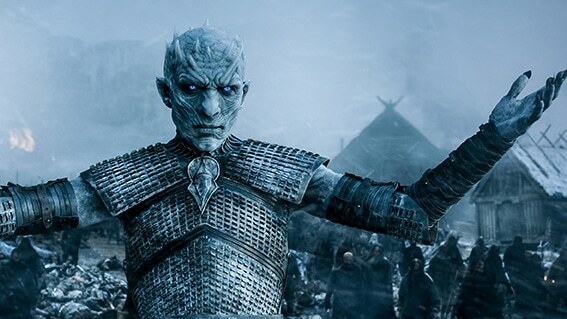 Just when you thought that King Joffrey was the ultimate evil king in the fantasy series, we were introduced to the unsettling Night King, the leader of the White Walkers. Prosthetics designer Barrie Gower created a crown for the villain which depicted icy thorns, wanting to give the villain a crown as a way of showing his regal position and a way of standing out from the rest of the White Walkers. The process includes creating moulds and silicon make-up and attaching a total of 13 prosthetic appliances to the actor Richard Colin Brake. 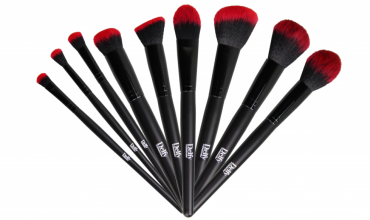 It takes five hours everyday to create the look by three or four artists at a time. The latest edition to the X-Men series presented Apocalypse – a 10,000 year old mutant out to destroy the human race. 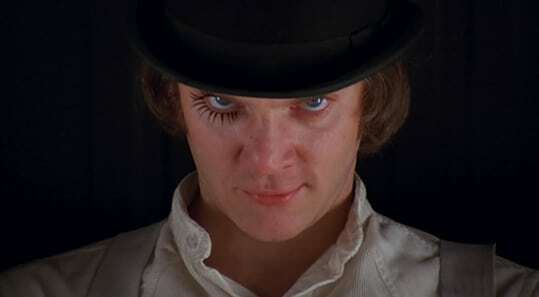 The director Byran Singer was very clear that he wanted to use make-up rather than using motion capture for the character. Rita Ciccozzi was in charge of creating the look of the world’s very first mutant. It took two hours everyday to transform Oscar Isaac into Apocalypse. CGI was used slightly in post-production to make the character appear bigger and more of a god-like figure. Sometimes the more realistic foes can be the worst ones. A prime example is the biographical sports film Foxcatcher – eccentric millionaire John du Pont helps two brothers become Olympic wrestling champions before things take a dark turn. Steve Carell is unrecognisable in the film as he plays the wrestling coach du Pont. Make-up artist Bill Corso had to change the shape of Carell’s nose, add a forehead prosthetic to change the placing of the eyebrows, and also change his skin tone to a lighter shade. Corso wanted Carell to look as close to the real du Pont as much as he could. Corso also worked with Channing Tatum’s hair and facial features to make him resemble the real wrestling champion. The artist also successfully aged all the characters by ten years for the final scenes. He added that “It’s rare that a project will require you to take a well know actor(s) and render them unrecognisable, and in the most sensitive and realistic of settings. That’s quite the challenge.” You can read more about the experience of Foxcatcher here. Colm Feore was transformed into the Frost Giant King Laufey – a chilling, villainous creature who wages war against Thor and the Asgardians. The look required prosthetic pieces, moulded to Colm’s body, to be applied all over for four and half hours every morning. Ve Neill and Arjen Tuiten, who sculpted and designed the applications, were on hand to help create this icy monster. 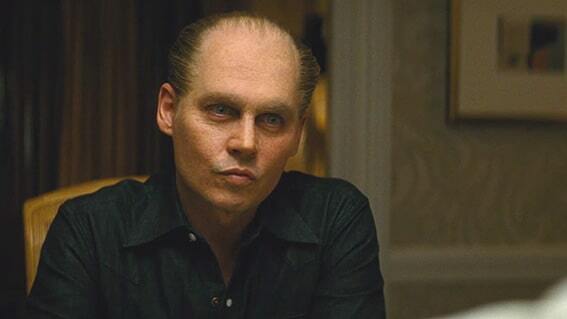 Johnny Depp became South Boston’s notorious violent gangster in biography crime film Black Mass. Joel Harlow has worked with Depp on several films including Pirates of the Caribbean and this teamwork shone through. Depp had a nose and forehead prosthetics with hand-punched eyebrows. The make-up changes slightly as the film goes through ’70s, ’80s and ’90s and there is a quick glimpse of an older Bulger when he was arrested. It took Harlow and the head of the hair department, Gloria Casny, two hours everyday to create the look. The Red Skull is a character which has Villain written all over him. Hugo Weaving did a great job of bringing such a prosthetic-heavy, masking piece to life. 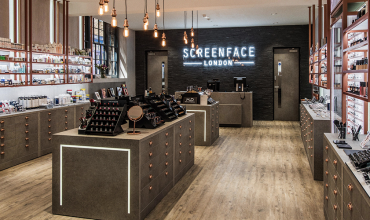 The look consisted of seven silicone appliances and three and a half hours of application to ensure they were fitted perfectly. A set of bottom dentures created the jutting, grimly set underbite, protruding from the wafer-thin mouth piece. Dave White and his team of prosthetics experts then added shading to the luminous red pieces, creating the effect of the skull’s crevices. With the wealth of comics to inspire them, Lizzie Yianni-Giorgiou and Dave White, as MU and Prosthetic Heads of Department, had plenty of material to help inspire their characters. But as for actually bringing a drawing to life, the processes were much more complex. 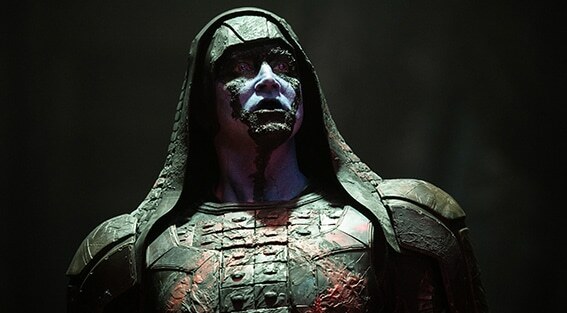 Lee Pace’s Ronan the Accuser, with his blue and black-dashed paintwork, was incredibly intimidating. Layers of periwinkle blue base, veins and the tar-like black combine with the arresting violet stare, creating an unusual and otherworldly villain. 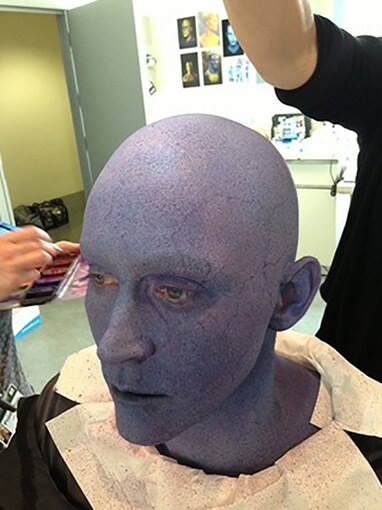 Guardians of the Galaxy used well over 1,000 prosthetic make-up applications and over 2,000 moulds of yellow, blue, and pink aliens were created. You can read our full interview with Lizzie about working on Guardians of the Galaxy. No list of film villains would be complete without Heath Ledger’s infamous Joker, regardless of whether the make-up was a factor to consider. But as it is, we think the deliberate, clumsily applied, clown make-up adds an element of realism to a character that can easily tip into panto-esque villainy. “We gave a Francis Bacon spin to [his face]. The corruption and decay in the texture of the look itself was grubby. You can almost imagine what he smells like,” director Christopher Nolan commented. Ledger wore three pieces of stamped silicone to help create his iconic scarred grin, which were so light he could barely feel them, and took less than an hour to apply by John Caglione, Jr. and his team. 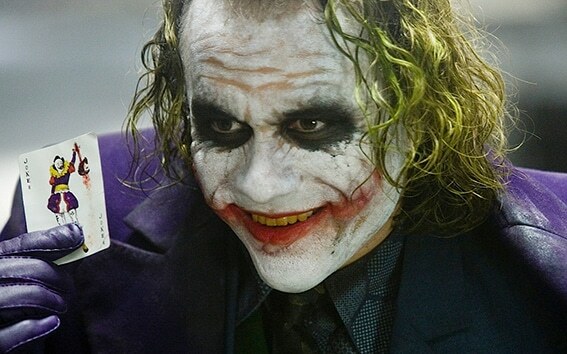 It’s also said that Ledger came up with the crude clown make-up himself, applying cheap greasepaint and a store-bought clown kit to show the make-up team his vision of the character, reasoning that the Joker would have applied the make-up himself, so Ledger should too. It was also his idea to leave traces of the white make-up on his hands, again suggesting that the character applied it himself. 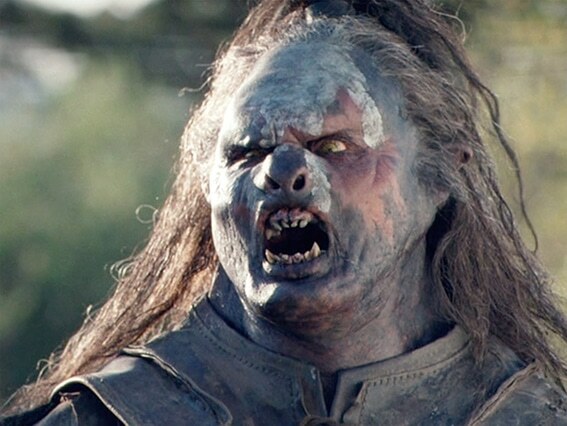 Hulking Uruk-hai leader Lurtz is intimidating to say the least. Brought to life by serial villain-player of the film series, Lawrence Makoare, this monster required the talents of Gino Acevedo and Jason Docherty from Weta Workshop. A gruelling process for both actor and artists, the full body applications and make-up took 11 hours to apply – often starting at 9pm the night before, ready for shooting the next morning. The head piece alone comprised of five pieces, while the heavy body elements were made of thick silicone, which was undoubtedly very difficult (and hot!) to fight in.